This week's giveaway is the sure to be controversial book When Teachers Talk: Principal Abuse of Teachers - The Untold Story by Rosalyn S. Schnall. Schnall, a retired Chicago Public Schools teacher with thirty-five years under her belt, interviewed five hundred Chicago Public Schools teachers about their experience with principals. The book contains the results of a survey as well as detailed interviews with many of the participants, most of which relate gruesome stories of horribly incompetent or outright abusive principals. Schnall's conclusion is sure to stir debate: "principal abuse of power and principal abuse of teachers... may very well be the most significant underlying cause contributing to the decline of public education in America today." That's quite a statement. Principal abuse of teachers (and principal quality in general) isn't a main focus of the national discussion of education reform and policy. How do we change that? Do we need to change that? There are a lot of good teacher suggested solutions in the book (mostly around more teacher oversight of school leaders and shared power), I'm skeptical that many of them are possible because of the kind of political will and capital that would be needed to pull them off. How do we overcome that? Is it fair to focus only on principals? Wouldn't you find just as much damning evidence about teachers abusing students (or colleagues) within the same group you surveyed? What about the school district leaders who choose principals and put them in difficult situations? Is this kind of problem restricted to our profession? If one were to survey employees in other similarly demanding professions, would we find the same kind of abuse by their superiors? In the book, Schnall argues principal abuse of teachers as perhaps the most serious issue holding back education in America. How does this issue rank compared to others cited as serious problems? Since this book demands discussion and debate, I'd like to give it to someone who would discuss the issues it raises with other educators--teachers, principals, school leaders, etc. Email teachforever@gmail.com by 11:59 pm CST tonight and tell me who you would like to discuss this with (and why). One lucky reader will receive the book (if you've won anything from me since giveaways started in January, you're not eligible for this one). Thanks to Phenix & Phenix Literary Publicists for providing a review copy of this book. Showing Your Passion wiki - A entrant into this week's giveaway sent along a wiki where his students explain their passions. Open High Blazing New Path [edReformer] - If you haven't heard of this Utah virtual charter school that uses open-source platforms for everything (and makes their own materials available as such), here's your primer. My passion is simply being with students. I am a high school mathematics teacher, but my favorite parts of the day are when students come in just to share life with me. I love connecting with my students and building relationships. It is the greatest feeling when a student feels safe enough with you to confide in you. It breaks my heart to think that some of these students do not have good home lives. Some may not have someone in their lives who cares about them or asks them about their day because they truly want to know. If I can let even just one student know that there is someone who cares about them and wants to invest in their lives, then that would make me the happiest person. Students are able to achieve so much more and have more motivation when there are people in their lives who care, and it is easy for some to fall through the cracks and go through life unnoticed. I have no idea what the job title for this would be, but that is my passion. I do get a lot of opportunities to connect with my students since I am a first year teacher and still young enough for them to feel like I am on their level. And I love going to work to see my students. I also come home and share so many stories about my day. Life with students in it is full of joy, surprises, and very fun! Two years ago we adopted our son from Haiti. Traveling to this country is truly a life changing experience. 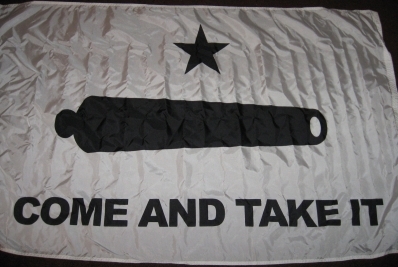 My passion is trying to find ways to help the people of this country any way I can. It really is a place you have to visit to understand the challenges the people of that country face. I think what I am trying to say that I want to make people aware of others and believe that it is human nature to help people out. That is what I try to convey in my students I see everyday! COMPASSION for each other, no matter our differences. If I could make enough money doing it I would build The Tutoring Spot into a tutoring company that serviced the high risk youth in Washoe County and beyond. I would not just tutor them or teach them, I would work independently of any state or national agency and teach them to learn. I would have the time and opportunity to develop comprehensive lessons that will engage even the most unengaged students. I would develop Freedom Writers groups to help engage students in English. I would build practical math groups that would teach students why they need to understand math and science, and would build lessons around the things they need to know. I would be able to develop a curriculum based on each student’s need rather than on funding requirements set forth by people who have never met my students. I would keep all my services affordable to all members of my community, and offer scholarships to needy students. The scholarships would be offered by local businesses with a desire to see the level of education in Washoe County improve. I would work with the school district, but not for them, to improve our educational ranking from the bottom and bring it up, slowly but steadily, until our students were performing at the levels I know they are capable of. I would grow The Tutoring Spot to reach areas outside of our local county and touch lives of students all around. And I would do this for all students, not just those whose parents can pay hundreds of dollars for initial tests, only to be told how many hundreds of dollars the actual tutoring would cost. I would offer this service to all in my community. Congratulations to Tracy. Stop by next week for another giveaway! I'll post this week's giveaway tomorrow; I'm still catching up on work and recovering from this weekend's Teach For America 20th Anniversary Summit. 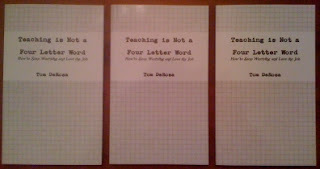 You can now get Teaching is Not a For Letter Word: How to Stop Worrying and Love the Job on your Kindle! It's only $6.25, less than half the price of the paperback version. My first book has enjoyed a great run on Kindle, so this is an exciting development for me! If you weren't one of the winners of this week's contest, here's your chance to get the book at a just-slightly-higher-than-free price. Gareth Davies, editor of the new South African quarterly The Business of Teaching, who will share his copy with an urban South African teacher to review for his magazine! Pat Hensley, who blogs at Successful Teaching and told me she will share the book with "entire PLN through blogging, plurk, and twitter; my graduate students (some who are already teachers and some preservice teachers)" and my favorite, "my husband who just doesn’t understand why I love teaching." I have to admit I'm not very good at such contests, mostly because I feel bad when someone doesn't win! Many of those who sent in a particularly compelling entry (that didn't win) received a digital copy of Teaching is Not a Four Letter Word as a consultation prize. I'm no prize-ologist, but that sounds like a pretty good reason to enter any and all contests I run on this site! I've got at least a couple more weeks worth of cool stuff to give away, so check back in over the next few weeks! 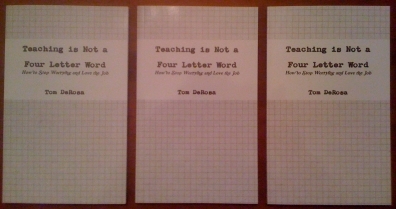 This week, I'm giving away THREE paperback copies of my book Teaching is Not a Four Letter Word: How to Stop Worrying and Love the Job. Of everything I've done over the past three years, this book is by far the accomplishment I'm most proud of. I really believe it can make a huge difference in the lives of teachers who are searching for inspiration and guidance. It's very important to me that this book be shared among colleagues; there's even a section entitled "Share This Book" that's modeled after ideas I learned from Seth Godin. So it should come as no surprise that I'm framing this week's giveaway around the idea of sharing the ideas in the book. If you're interested in a chance to be one of the randomly chosen winners, simply email me (teachforever@gmail.com) and tell me who you will share the book with when you're done with it. I'll except entries until 11:59pm CST tonight. Thank you as always for your support of this blog, and good luck!